The cast of Fox's "Utopia" with network executives. 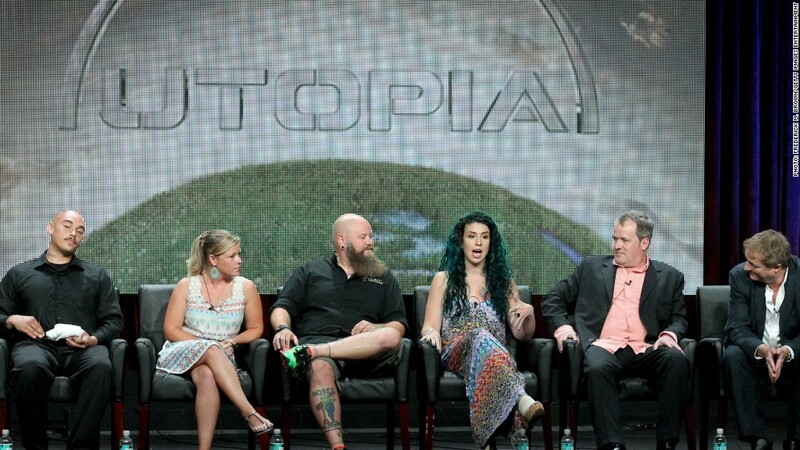 Fox has axed its ambitious reality show "Utopia." The show -- which was supposed to document the lives of 15 strangers over a full year as they tried to build a perfect society -- was Fox's attempt at TV experimentation. However, the series was a ratings dystopia for the network, so it's ending 10 months shy of its expected conclusion. The show opened decently enough on Sept. 7 with 4.6 million viewers, but couldn't gain momentum and went steadily downhill from there. It was originally shown on Tuesday and Fridays, but the series was sidelined to just Friday, a tough night for TV. Its audience dwindled to fewer than two million viewers on some nights. Last Friday's episode brought in just 1.5 million viewers. Fox's head of reality Simon Andreae originally described "Utopia" as "the largest, most ambitious social experiment on television," but the show proved to be a costly gamble that couldn't pay off for the network. Reports had the series costing Fox upwards of $50 million. "Utopia" is just one of the struggles that Fox has faced this TV season. Its Steven Spielberg-produced dramedy "Red Band Society" has rated poorly and the network recently cut the number of episodes of its new comedy "Mulaney." For the time being, "Utopia" Friday time slot will be filled by repeats of the Gordon Ramsay-led cooking competition "Masterchef Junior." While a big cancellation for Fox, "Utopia" is not the first casualty of the new season. ABC pulled the plug on the comedy "Manhattan Love Story" last week.